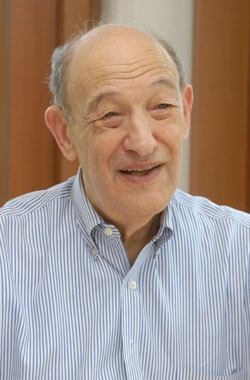 Ezra F. Vogel is the Henry Ford II Professor of the Social Sciences Emeritus at Harvard. After graduating from Ohio Wesleyan in 1950 and serving two years in the U.S. Army, he studied sociology in the Department of Social Relations at Harvard, receiving his Ph.D. in 1958. He then went to Japan for two years to study the Japanese language and conduct research interviews with middle-class families. In 1960-1961 he was assistant professor at Yale Universityand from 1961-1964 a post-doctoral fellow at Harvard, studying Chinese language and history. He remained at Harvard, becoming lecturer in 1964 and, in 1967, professor. He retired from teaching on June 30, 2000.
of the Fairbank Center (1995-1999) and the first Director of the Asia Center (1997-1999). Vogel was Chairman of the Harvard Committee to Welcome President Jiang Zemin (1998). He has also served as Co-director of the Asia Foundation Task Force on East Asian Policy Recommendations for the New Administration (2001). Drawing on his original field work in Japan, he wrote Japan’s New Middle Class (1963). A book based on several years of interviewing and reading materials from China, Canton Under Communism (1969), won the Harvard University Press faculty book of the year award. The Japanese edition of his book Japan as Number One: Lessons for America (1979) is the all-time best-seller in Japan of non-fiction by a Western author. In Comeback (1988), he suggested things America might do to respond to the Japanese challenge. He spent eight months in 1987, at the invitation of the Guangdong Provincial Government, studying the economic and social progress of the province since it took the lead in pioneering economic reform in 1978. The results are reported in One Step Ahead in China: Guangdong Under Reform (1989). His Reischauer Lectures were published in The Four Little Dragons: The Spread of Industrialization in East Asia (1991). His most recent publication is Is Japan Still Number One? (2000). He has visited East Asia every summer since 1958 and has spent a total of over six years in Asia. Vogel has received honorary degrees from Kwansei Gakuin (Japan), the Monterrey Institute, the Universities of Maryland, Massachusetts (Lowell), Wittenberg, Bowling Green, Albion, Ohio Wesleyan, Chinese University (Hong Kong) and Yamaguchi University (Japan). He received The Japan Foundation Prize in 1996 and the Japan Society Prize in 1998. He has lectured frequently in Asia, in both Chinese and Japanese. From fall 1993 to fall 1995, Vogel took a two-year leave of absence from Harvard to serve as the National Intelligence Officer for East Asia at the National Intelligence Council in Washington. He directed the American Assembly on China in November 1996 and the Joint Chinese-American Assembly between China and the United States in 1998.